The internet is flooding now with a simple question, "What surgeon do you recommend for Nuss surgery?" There are a lot of factors involved in making one of the biggest decisions of either your or your child's life. This list of questions to ask might be helpful in determining the right surgeon for you. The information, including but not limited to, text, graphics, images and other material contained in this discussion are for informational purposes only. The purpose of this article is to promote broad consumer understanding and knowledge of various aspects pectus surgery. It is not intended to be a substitute for professional medical advice, diagnosis or treatment. Always seek the advice of your physician or other qualified health care provider with any questions you may have regarding a medical condition or treatment and before undertaking a new health care regimen, and never disregard professional medical advice or delay in seeking it because of something you have read on this website. 1) HOW MANY SURGERIES HAVE YOU PERFORMED ON SOMEONE MY AGE? This is by far the #1 most critical question to ask - especially if you are over 25. Nuss surgery on a 30+ year old requires different techniques than one someone 14 years old. Most pectus surgeons are pediatric surgeons (Nuss was originally developed as a technique for children and teens by pediatric surgeon Dr. Donald Nuss) and have a lot of experience on kids and teens. The pediatric surgeon who tries to Nuss a 35 year old with the same techniques as the teen may end up with a failure. As a general rule, anyone who has performed over 75 surgeries should be considered “experienced”, but only for that age group. 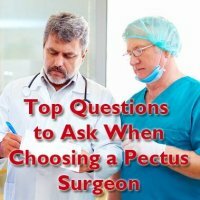 Some surgeons that you may find on pectus.com are performing Nuss surgery infrequently (a few times per year). There are some pectus “specialists” that perform over 100 surgeries every year. If your local surgeon does only 2-5 surgeries per year, you may want look for a surgeon with more experience. There is no substitute for "hands on" experience when it comes to this surgery. 2) Do you recommend the Nuss procedure or Ravitch and why? Nuss does not remove cartilage or bone - it simply pushes everything up into place where it heals (like braces for the chest wall). All of the bones and cartilage remain intact. Removal of parts of the chest wall during Ravitch will cause rigidity even if all of the parts heal together properly. In some cases, the bones do not grow back together properly which can cause free-floating ribs or even a floating sternum (osteonecrosis and malunion). Repair of these types of Ravitch failures often require advanced techniques by specialized surgeons later on. Nuss surgery will create smaller scars on the sides and possibly 2 small incision scars on the front of the chest (if surgeon uses forced sternal elevation - see below) while Ravitch will create a larger scar in the front of the chest. Ravitch should not be done on any patient that is not yet done growing. Removal of the bones and cartilage before growth has finished may result in an underdeveloped chest wall that will eventually fall in again in the future. Some adult patients may require some form of Ravitch procedure if the patient is 1) older and more rigid or 2) asymmetrical with some carinatum and some excavatum. In these cases it's not unusual to see a hybrid Nuss/Ravitch procedure. The surgeon will flatten the sternum by detaching some of the ribs from the sternum, attach them back together with titanium plates, and then lift the newly-built sternum up into place with Nuss bars. There are still many Ravitch surgeons around the world that have yet to learn the Nuss technique which may be why some are still recommending this older technique as a primary repair option. The Nuss procedure carries with it a steep learning curve. It requires a lot of hands on experience with many types of patients of many different ages. It also requires a specialized hospital staff that can care for the patient. Nuss is now the primary surgical procedure for the repair of pectus excavtum; however, in the hands of an experienced surgeon with many successful repairs, modified Ravitch is still an option for an adult patient. For more information on this topic, see this video of Dr. Jaroszewski explaining why she uses Nuss as the primary repair option on 90% of her cases. 3) DO YOU USE A VIDEO CAMERA WHILE INSIDE THE CHEST? Knowing at all times where your instruments are helps to reduce the risk of complications. Perforating the heart or lungs is a major risk and techniques that can be used to reduce this should be taken. This should be a standard requirement. In our opinion, Nuss surgery should not be performed without using an internal camera to guide the surgeon. Cameras with a flexible tip are considered to be the best. They also come in 3D versions. 4) DO YOU PRACTICE FORCED STERNAL ELEVATION? This is becoming a normal part of Nuss surgery, but not all surgeons practice it yet. In the Nuss procedure, the surgeon needs to pass the metal bar(s) between a beating heart and sternum from one side of the chest to the other. One problem: the sternum can be pressing down firmly against the heart so squeezing the bar between the two can be very dangerous. Also, the dent can actually funnel the tip of the bar down into the heart or lungs when it is being passed sideways through the space. By elevating the chest wall at the point of the deformity prior to surgery, the surgeon creates a space between the sternum and heart so that the bar(s) can pass safely over the heart. 5) WHAT COMPLICATIONS HAVE YOUR PATIENTS EXPERIENCED? Any good surgeon's office will be able to list their major complications of surgery. Complications can range from common pneumothorax (air in the chest cavity) to cardiac puncture and rarely, death. The code of professional conduct of the American college of surgeons has each member pledge to share all adverse events in the U.S. when requested. 6) How many bars do most of your patients require? The original method of Nuss repair was done with only one bar. More and more surgeons are now turning to 2, 3, and even 4 bars for a proper correction (usually the older or larger you are, the more bars you need). Here's why: the ribs and sternum apply a lot of downward pressure on a pectus excavatum patient. The deeper the dent or older the patient, the more pressure pushing inwards. Using a single bar will cause 1) more pressure in one spot as opposed to spreading that pressure over multiple bars and 2) a tendency for that single bar to flip because it is under so much tension. Therefore, more bars actually equals less pain and less of a chance for a bar to flip. Also, there is evidence that more bars gives a better overall cosmetic appearance afterwards. Think of it like holding up a large tent with only one pole vs two or more. For a young patient with a smaller, mild dent, one bar may be all that is needed. 7) HOW LONG DO YOU RECOMMEND KEEPING THE BAR(S) IN PLACE? The research from Children's Hpspital of the Kign's Daughters (birthplace of the Nuss procedure) is very clear on this: 2 years should be the absolute minimum for all kids and teens (see above - data courtesy of CHKD). Most surgeons now are extending this to 3 years for a 99% success rate for all patients. All adults should keep bars in for minimum of 3 years. Some surgeons are allowing up to 4 years as long as routine x-rays are done to rule out sternal erosion (the bars working their way into the sternum). There is a 99% success rate when bars are left in for at least 3 years. It is not a good idea to keep the bars in "forever" as complications can arise such as sternal erosion. Also, it can be very difficult or dangerous to remove bars that have been in too long and are now fused to the bone. 8) DO YOU TEST FOR METAL ALLERGIES USING THE ALLERGEAZE TEST? This is more important for kids and teens. Usually by 20 years old we know whether or not we are allergic to nickel or any other type of metal; however, if you are unsure, make sure you get the AllerGEAZE test prior to surgery. This will not only test for nickel allergies, but also for the other trace ingredients of the Nuss bar. It is better than the older T.R.U.E. test so be sure are you tested with the AllerGEAZE test. 9) average length of hospital stay? A few years ago it was standard for a patient to stay in the hospital for 6 days. Now in some hospitals,there are patients discharged after only 3 days. This means less pain, less meds, and less cost for these patients. The difference is in pain management and the experience of the anesthesiologist and hospital staff. Ask about your hospital’s normal length of stay. 10) May I speak to SOME PAST PATIENTS? A good surgeon will have many happy patients and hopefully raving reviews. If you cannot find any reviews online, simply ask your surgeon for a list of patients that you may be able to talk to. 11) WHAT CHOICES OF PAIN MANAGEMENT DO YOU PROVIDE? Again, this is not a deal breaker but some hospitals are now opting for the On-Q pain system instead of an epidural. Epidurals carry a certain risk and sometimes do not "take" anyway. Most patients that have used the On-Q system have had very good pain control on par with epidural but with less complications. The epidural is also a good option - it just carries more risk. 12) DO YOU PRACTICE RIB FLARE REDUCTION or upper chest correction? Most patients who undergo Nuss surgery are A) looking to feel better but also B) hoping to achieve some sort of normal cosmetic outcome. Only one of these is the surgeon's job though. A pectus surgeon’s main objective in simply to lift the sternum off of the heart to improve cardiac output. It is not the surgeon’s job to make you look better, but it's usually a side effect. However, some surgeons will do their best to achieve the best cosmetic outcome possible. This means that if you have a very large and/or deep dent, a surgeon may simply use one bar right over the heart. This can make the patient look rather odd as the upper dent can remain after the bar is in place. The only time rib flare can be reduced is while in surgery. If your surgeon does not perform rib flare reduction, it may remain after surgery. If you are concerned about how you will look after the surgery, ask about any of these if they pertain to you. Do not assume that your surgeon will lift the entire chest or reduce rib flare - just ask. 13) What does your preoperative workup consist of? 14) WHAT METHOD DO YOU USE TO PREVENT BAR FLIPS/MOVEMENT? This is not a deal breaker question by any means, but it's nice to know what type of system the surgeon uses to try and prevent bar slippage and flipping. The original (and still the most widely-used method) to fix the bars in place is with a metal stabilizer on one or both sides. The stabilizers are rigid and attach to the bar firmly (but only tied to the ribs). They can cause more pain and their presence does not ensure the bars will stay in place (especially for adults as the larger space between the ribs may allow for the stabilizer to pass through). Some surgeons have started using soft Fiberwire. The Fiberwire attaches the bars to the ribs in multiple places for each bar. This method is less painful and anecdotally achieves the same low rate of bar movement. Studies are being done now to answer this question definitively. Rest assured that both methods are considered to be acceptable by the surgical community. Some surgeons are just more comfortable with one or the other. 15) HAVE YOU ATTENDED ANY OF THE RECENT ADVANCED PECTUS COURSES OFFERED BY PECTUS SPECIALISTS? Again, not a deal breaker question, but a lot of advancements are being made to the field of Nuss surgery right now and things are moving quickly. Not all surgeons are aware of these advancements. One way to be sure they are up-to-date is if they have attended some of these Advanced Courses given all over the world by top pectus surgeons. The top surgeons in the world lecture a few times per year to those interested in learning the very latest techniques. This is not actually a question for a surgeon, but a question for the patient. While traveling distance to a surgeon is important, this should not be the primary reason for choosing any surgeon for any surgery. This surgery should only be done once, so finding a surgeon that you are comfortable with and confident in is of utmost importance. In 20 years hopefully Nuss surgery will be so commonplace that there will be experienced surgeons within 100 miles of most patients. Now however, there are a handful of true "specialists" that strictly do pectus surgery while the bulk of surgeons only do a handful per year. Even less specialize on adults. If you must consider travel distance, then maybe only to break a tie between 2 comparably experienced surgeons. There are many factors that you need to consider when choosing a surgeon. These are some of the more-important questions we feel a patient would want to know when making this important decision. This list may change as time goes on. As always, the decision on which surgeon to use is ultimately up to the patient and/or the patient's family.